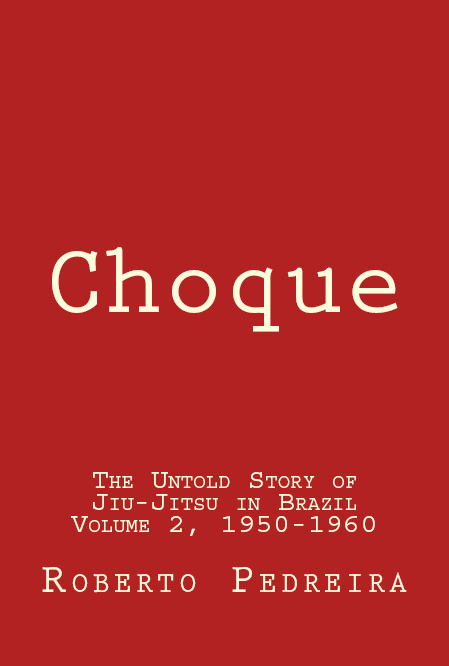 Choque: The Untold Story of Jiu-Jitsu in Brazil, Volume 2, 1950-1960, describes the big and small fights of the famous and forgotten heroes, myths, and legends of Brazilian jiu-jitsu, based on verifiable Portuguese and Japanese sources. Six appendices are included, listing fighters, fights, and academies, individual records (of representative fighters), and lineages of the most productive teachers. A few of the many individuals discussed are: Landulfo Caribé, Azevedo Maia, Carlos Gracie, Helio Gracie, George Gracie, Robson Gracie, Carlson Gracie, Oswaldo Fada, Almir Ribeiro, João Alberto Barreto, Helio Vigio, Masayoshi Kawakami, Haroldo Brito, René Bastos, Biriba, Nilo Gutierrez, Adomildo Nascimento “Borrachina”, Oswaldo Alves, Shunji Hinata, Pedro Hemeterio, Sakai, Takeo Yano, Waldemar Santana, Valdo Santana, Passarito, Artur Emidio, Sinhôzinho, Genarino Piemontese, Mauro Gonzago, Amauri Guarilha, Moacir Luzia Vale, Armando Wreidt, Paulo Romito, Rudolf Hermanny, Cirandinha, Guanair Vial, George Mehdi, Masahiko Kimura, and hundreds of others. Full references are provided. An index is included to supplement the appendices Thirty-eight illustrations are included. Choque 2 is also available for Kindle and other digital devices (below).